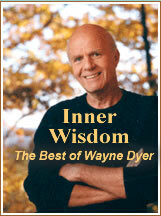 Inner Wisdom: The Best of Wayne Dyer – CD collection – Discount! Learn how to tap in to your inner power with Wayne Dyer with this 20-CD collection of his most beloved audio classics. Now, for the first time ever, you can discover the essence of an acclaimed author, psychologist, philosopher, and living legend, Wayne Dyer, in a unprecedented anthology. Vast in its scope, this complete library brings you the very best of Wayne Dyer…offering a comprehensive cross-section of his incredible 25-year career. Through both live and studio recordings, Dr. Dyer will guide you to a higher level of consciousness and self-awareness as he offers illuminating insights on such topics as self-actualization… knowing… purpose… love… and change. You will discover how to master your expectations while expanding your self-concept, achieve phenomenal mental health, live in harmony and abundance instead of disharmony, empower your children to succeed in life, tap the incredible power of visualization to get what you desire and much more.